1. Preheat the oven to 190˚C (170˚C fan). First, combine the flour, baking powder, bicarb, Chilli Pepper Pete’s Ras-el-Hanout, cinnamon, salt and sugar in a large mixing bowl. 2. Next, in a mixing jug, beat together the vegetable oil and the four eggs, then add to the dry ingredients and mix briefly – don’t overbeat it, as it’ll make the resulting cake chewy, so just mix well enough to get rid of any big lumps and don’t worry about the little ones. 3. Grease a deep, loose-bottomed 7 inch cake tin, and line the bottom with a circle of greaseproof paper. Pour in the cake mixture and place in the oven for 50 minutes, or until the cake is well-risen, springy to the touch, and a fork inserted into the middle comes out clean. 4. Allow the cake to cool in the tin for a minute or two, then gently remove it and place on a wire rack to cool. 5. Once the cake is completely cold, you can decorate it. Weigh out the cream cheese, icing sugar and butter in a bowl and beat with a whisk until smoothly combined and nice and thick – when you first mix them together the mixture will be very sloppy, so keep beating it until it thickens up again. 6. 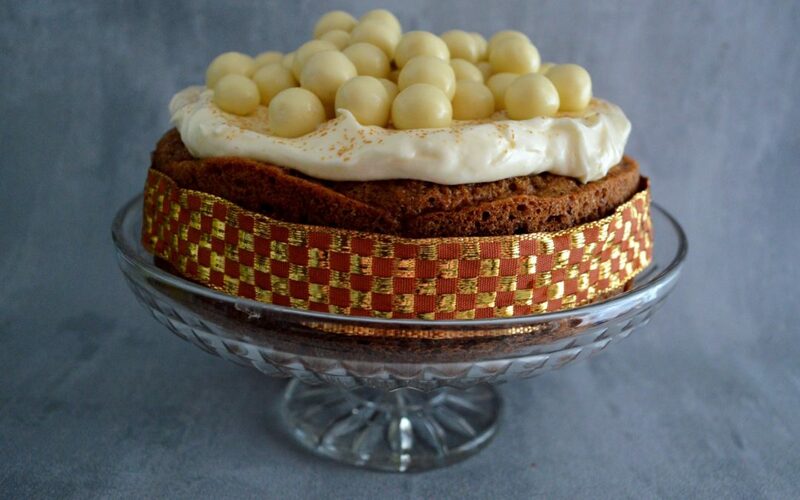 Finally, top the cake with a generous layer of frosting, and finish off with a sprinkle of edible glitter and a pile of white chocolate Maltesers. Wrap the ribbon around the cake and tie with a bow, or secure neatly with a dressmakers’ pin.